There is an amex offer for fresh direct which gives you $30 back on a purchase of $100 or more which you can use that card to do it twice which will give you up to $60 off ($30 off your first order of $100 and $30 off you second order of $100 or more! )and on top of that fresh direct is offering a promotional intro of $50off each purchase containing $125 or more and they give you this $50 credit off your first two orders which is a total of $100 promotional discounts,it works only online so for the delivery they have for the first 60 days for only 1cent and then for $69 if u dont cancel after 60 days ,Here you can make an account for fresh direct Valid only for orders totaling $125 or more before taxes or delivery fees. Expires on 12/31/2016. May not be combined with any other promotion code. Limit: one per customer/household. Re: 125$ of food for only 45$ on fresh direct grocery!! never actually bought from them, wonder if it works out like that to pay 45$for 125$spent in the store ?? ,if it does its an amazing buy ! !will hopefully place an order some time later and will get back to confirm. what exactly more than 100 bucks car you buying from there in one shot? isn't it $150 of food for $70? because if you deduct $50 from $125 your only left with $75 order, not enough for amex credit? Yes that's true but if you try to call Amex and get it lowered to $75 instead of the hundred dollars then everything fits in perfectly I didn't realize that originally ! +1 works great for one who got 75$ needed to be spent! That's only true in % terms. Who doesn't spend $100 on groceries? In that case, he's losing out on an actual $5. Otherwise, great find OP! $70 for $150. Not everyone spends $150 on groceries at a time. (And you need to spent that much to still have the $100 minimum to get the amex credit). 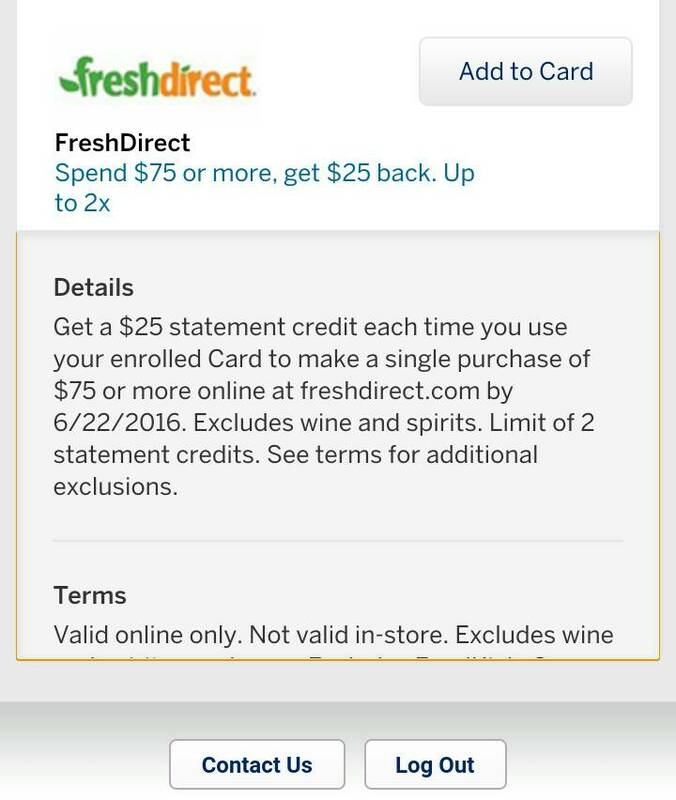 Pretty sure i posted a similar type of deal the last time amex had a freshdirect offer. The only thing that you have to be careful with is that they wont necessarily fulfill the whole order - sometimes they wont have something in stock and will remove it from your order. Also the price on anything weighed (ie meat) is just estimated. So you probably shouldnt spend exactly to the amount that you need. The only people who can't put together a $150 grocery order are anorexics, bulemics, and bochurim. Any family of 2+ can spend $150 for shabbas alone in a heartbeat. Anyone know the usual price of ribeye steak? Is $17.99/lb a good deal? On fresh direct? You can't buy meat and other kosher products.